The Bissolotti workshop is quiet, very quiet. The main space is dimly lit, shutters drawn, here and there a work lamp alight and pulled down close to the bench. A large statue of Stradivari dominates the reception area and wherever you look, including over the entire ceiling, intricate carvings and marquetry work are on display, all executed by Francesco Bissolotti himself. It seems as much a temple as it is a workshop. 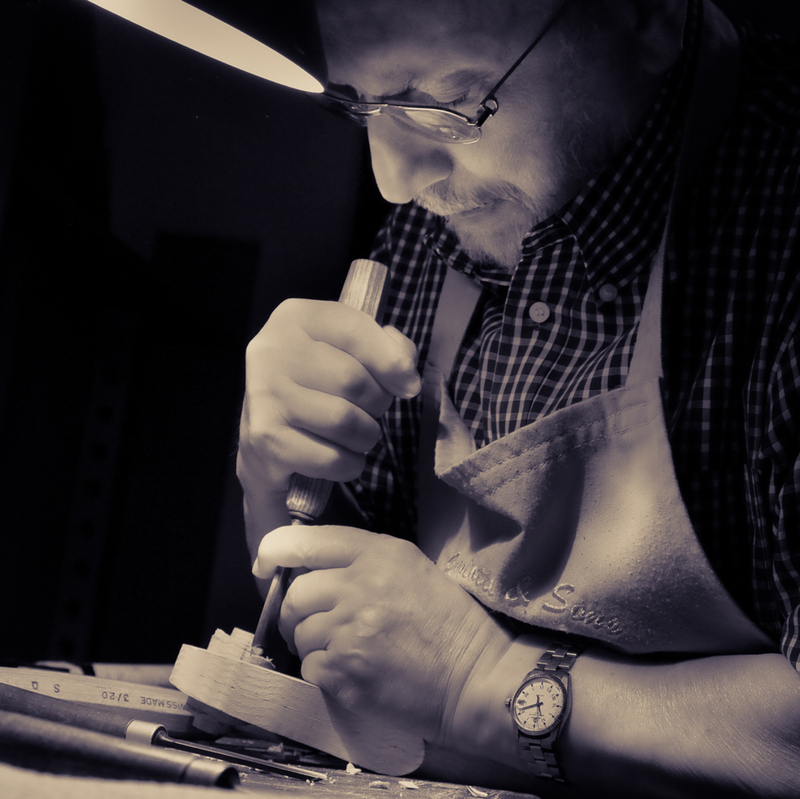 The makers go quietly, almost reverently about the daily business of violin making. 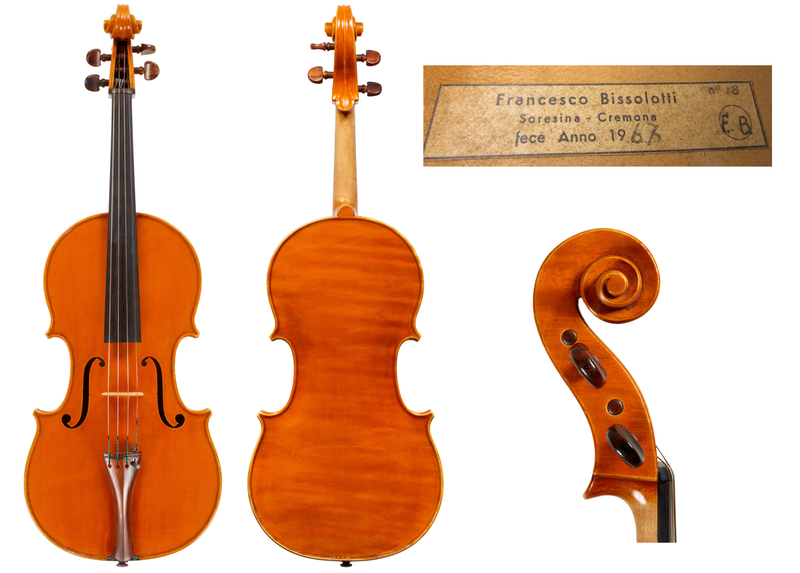 Is this due to the devotion and intense dedication that Bissolotti has given to his work over the last 72 years? He seems to have found peace in the certainty that it was his destiny to resurrect the internal form and champion its use. To have suffered in its name is for him no dishonor. 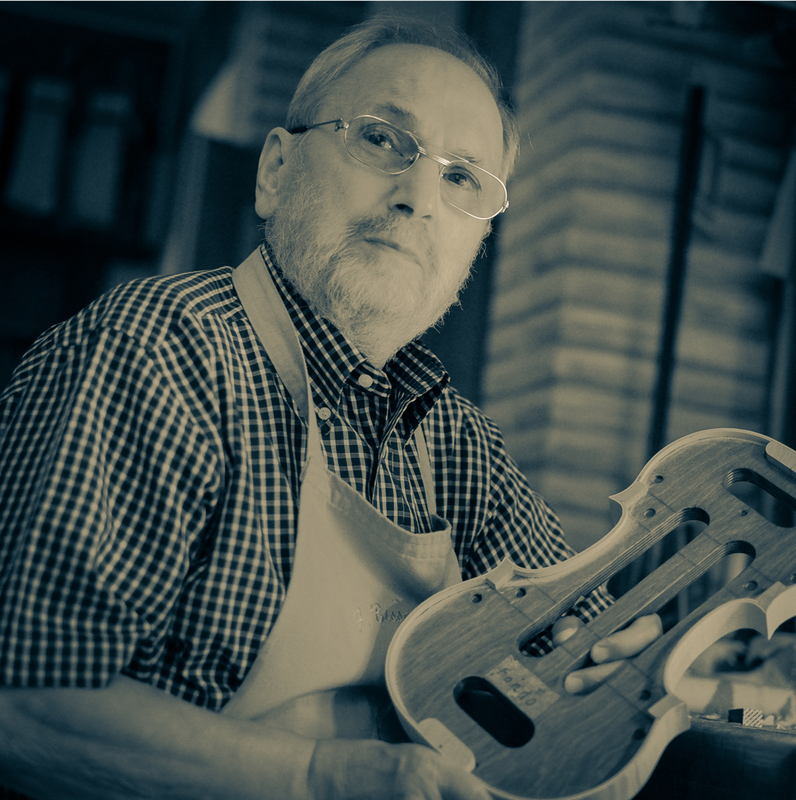 Still eager to get to the bench at the age of 87, Bissolotti is generous with his time, gentle and keen to communicate his understanding of what violin making should be. ‘If you innovate you’ll make ugly stuff,’ he says quietly, with the certainty that only a lifetime’s experience can give you. It’s a fine line between ‘innovating’ and doing something personal. Novelty for novelty’s sake is a modern concept in an age in which the individual is often prioritized over all else. 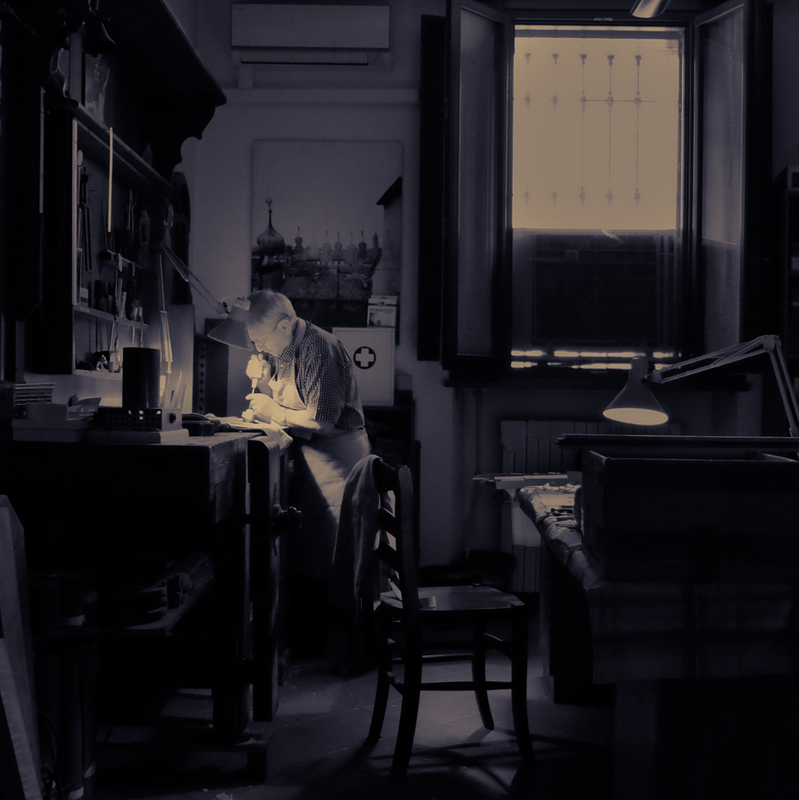 The Bissolotti workshop is not like that: its father and its sons are steeped in tradition, with a reverence for the past and a common goal. Four family members, indeed five before the tragic death of Bissolotti’s son Tiziano, working alongside each other at the bench, getting their coffees from the same bar in the same town every day for decades is a dying tradition – an aspect of Cremona that has almost disappeared. In the Second World War I was bombed by the Americans and the English. According to the politicians they were our enemies, but I see the whole world as friends – English, American, Chinese… I was in a temporary factory working for the Germans when I was 13, repairing lorries for them. There were always two or three Germans in the place with machine guns round their necks, shouting – ‘work!’ They also shot people and left them for dead. However, I was lucky – I lived through the war and didn’t have to participate in it. We were always hungry, but as I lived in the countryside we had pigs and chickens and so we didn’t die of hunger. I didn’t visit Cremona at all during the war. The Cremona school of violin making was founded in 1938 but war broke out in 1940. A few years after the war had finished the school reopened but with very few pupils – I alone made up a whole class. I had an uncle who was a cabinet maker and by the age of seven I already had a lot of experience with the fret saw and other tools. In fact in the first couple of months at the school I had produced a violin while the others took a couple of years to get to that stage. For three months I studied with Pietro Tatar. Then he went to the United States and they had a competitive exam to replace him, which [Giuseppe] Lucci from Rome won. However, the salary was such a pittance that he didn’t accept and they appointed Pietro Sgarabotto. Sgarabotto brought with him the internal form. Not exactly the classical one the early Cremonese makers had used but it was a start. So I had Sgarabotto as a teacher and later [Ferdinando] Garimberti and [Giuseppe] Ornati, who both led a restoration course as well. Sacconi said to me when he visited the school [in 1958], ‘What are you doing here? This school is being ruined by this French method of the external form. Come with me to the museum and I’ll explain to you exactly how they made those classical Cremonese instruments.’ Together we reorganised the whole Stradivari Museum and it took us two whole years. I restored the forms that you can see now all lovely and clean. They were so filthy you couldn’t even read the wording on them. At the school there were loads of old forms that Tatar had made, French ones – I went down there with the band-saw and cut them up, threw them all out. My goodness, the angry response – ‘What have you done here?’ So we started from scratch. I am the source of the movement to bring back the internal form. When I was teaching at the school and the foreigners began to arrive I was teaching the classical Cremonese method, whereas Morassi and others went on teaching the French system. Sacconi took a liking to me because he had realised that I understood where he was coming from. He invited me to the US in 1962 but I didn’t accept because I was already married with four children. He said, ‘I’ll go back to America, I’ll find you a house. Then you come over a year before and we’ll get everything ready for your family.’ But changing language would have been difficult for everyone and my wife didn’t want to go. Sacconi said, ‘Well, seeing that you can’t come we’ll give you the work to do here.’ I was working for them [the Wurlitzer firm] for several years. I had a lively correspondence with Sacconi and when he came to Cremona for two months every year I gave him the keys to my workshop. I’ve had five children, four boys and a girl, but unfortunately there is no Bissolotti who is going to carry things on into the third generation. My son Tiziano was an extremely good maker – the one who was most like me. He was an excellent draughtsman and had learnt his craft well, but destiny wanted it to be otherwise [Tiziano died in 1995]. It’s a tragedy for a parent to lose a child. I got over this by throwing myself even more deeply into my work – my work saved me. After my family the only reason I have for living is my work. We were a quintet, me and the four sons – however, as I was never able to become a pawn of the local politicians they shut me out. I left the school [in 1982]. Leaving was the best thing I could do. I made my own way after that. The most important thing is to make good violins that please musicians – but I didn’t run after the musicians. To improve you need to be in contact with the musician, but you need to find the right ones, those who have heard more than just their own instruments. I have heard hundreds of violinists – my ears are well trained. I’ve done a lot of experimentation with other types of wood and some of the results are acoustically an improvement on maple – but you know what these musicians are like! I have always fought for the internal form but it seems that I’m just bashing my head against a wall, the other makers don’t want it. However, when they enter a competition like the Triennale the maker should declare the method with which he made his instrument – out of professional sincerity you understand. They all keep it secret, they never say how they built it. The important thing about the Cremonese method is that every time you make a violin it’s a one-off. There’s a form to which you have to attach the blocks and shape them each time. Whereas with the French method they have the table and back already drawn up and they can make a thousand tables and backs exactly the same. They’re making a thousand violins, all twins. While with the Cremonese method you have to shape the points according to how you are feeling at the time and in tune with the process. Every time you are making a ‘new’ violin. It’s the method that allows the artist the possibility of expressing himself and his professional capacity. However, I’ve had a job getting them to understand. I’m writing my life story at the moment. Who knows how it will turn out for me, but at least I’ve been sincere and have told the whole story about those who have sabotaged me. These days in Cremona you come across pre-made Chinese and Bulgarian violins. I, on the other hand, have always said to my sons, we will always choose the Cremonese method, we’ll season the wood ourselves and build from scratch. We haven’t wanted to get rich with our violin making but to make good instruments. I would say that if you want to make good violins then you need to see what our ancestors have done in order to move forward. If you just want to be innovative you’ll make ugly stuff – we need to treasure our past. I haven’t become rich but I live decently. I haven’t got that much time left, as last year I had a nine-hour operation and they’ve given me only a few years. I want to dedicate that time to explaining to my sons all I know about violin making. I feel that time is escaping me – I’m 87. But I’m still working! Francesco Bissolotti died in January 2019.